Plymouth Rocks are one of Australia’s favourite Heavy Breeds of Fowl along with the Wyandotte, Rhode Island Red and Australorp. Plymouth rock is a heavy breed which does not start laying till about 24 weeks old. The barred rock hens do lay well once up and going. Plymouth rocks come in both dark barred and light barred. There are also some other colours but they are very rare in Australia. The Barred Rock is often called the Plymouth Rock, but this title correctly belongs to the entire breed, not just the Barred variety. Plymouth Rocks are large, long-lived chickens and are good layers. They possess a long, broad back; a moderately deep, full breast; and yellow skin and legs. The hens have a deep, full abdomen, which is a sign of a good layer. The face of a Plymouth Rock is red with red ear lobes, a bright yellow beak, bay-colored eyes, and a single comb of moderate size. Their feathers are fairly loosely held but not so long as to easily tangle. They are docile and may show broodiness. The hens usually make good mothers. They are friendly and curious. This breed was developed in America as a dual purpose bird being good layers and good table bird. They are docile and because of their size do not fly well and therefore make great backyard birds. The striking Barred plumage of black and white stripes is easily recognized by most people who are aware of pure breeds of poultry. One of the most attractive features of the American breeds is their beautiful yellow/orange leg and beak colour. In the Australian Farm Census of 1900 the Plymouth Rock was kept on 60% off all Australian Farms. 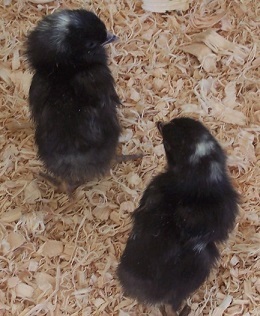 Chick ID: chicks are predominately black with a white spot on back of their heads. As they feather wings tips start to bar. Egg Laying: very good – all year round. Plymouth Rocks lay a large egg and continue laying throughout the winter but with decreased production. Egg Colour: Brown but vary in colour from light to medium brown with a touch of pink. Personality: Smart and docile. Best described as calm! These birds are good with children and great for people who are new to keeping chickens. They are sweet and genuinely want to be around you and your pets.